The difficulty in choosing plants for your garden is cutting down the list of plants you love to the list of plants you will use. This is even harder for a small garden. Avoid some of the hand-wringing by creating a framework for plant selection before you begin your list, and follow it as you chop it down. Money, time, and your existing yard all factor in the planning of your new garden area. Something to consider in any garden design is how much money you're willing to spend. A small garden should cost considerably less than its larger cousins, but there is still an expense. Growing some plants from seed or sowing seed directly in the garden might not give immediate gratification but will be cheaper than buying already established plants from the garden center. Don't forget to budget for any soil you must bring in or amend. Also, if you have your heart set on any large, expensive specimen plants, you may want to create your garden in stages, over a series of years. Except for trees, it is usually easier to remove existing plants than to design around them. You can save the plants to incorporate into your design, move them to another area, or give them to a grateful gardening friend. What types of plants will survive under the tree's shade and over its roots? Will you need to remove part of the existing hedge or other perennial to make room for the garden? United States Department of Agriculture hardiness zones and sun exposure: You can change your mind about color or style, but knowing your zone and what will or won't grow well there is helpful when weeding contenders out from your list. You'll have to be tough with yourself now, or you'll be making work and regrets for yourself later. A perennial plant that isn't hardy in a zone 4 garden is going to be an annual. And plants that suffer from too little or too much sun where planted are going to attract all kinds of problems. Because this is a small space garden, maintenance will be less intensive. But be honest with yourself about what you are willing to do. 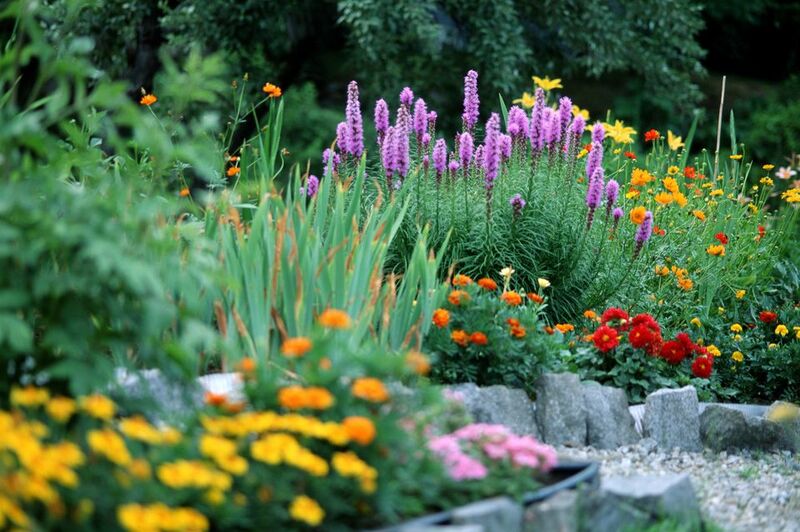 Your garden may look good initially, but many perennials need to be divided every few years or they will start to die out or perhaps squeeze out their neighbors. After you have the basic considerations down—the things that don't change, like climate—then the fun of figuring out the space and choosing the plants can begin. Graph paper will help so that you can draw the space to scale. Garden size: Obviously the smaller the garden space, the fewer plants you can have in it. This is especially true if you choose to use a large, focal point plant. A small space looks cluttered fast if there is too much diversity. Just think of how your home feels when toys and clothes are strewn all over the place. Proportion: Small gardens still need to have balance. The rule of thumb for garden borders is that the width should be no less than one-third the length. But small borders tend to look better with at least a 1-to-2 ratio. If you followed the one-third rule in a small border, you'd have a 6-foot border that is only 2 feet wide. This doesn't give you much space to create a sense of depth. To continue our example, if you create a 6-foot border that is 3 or even 4 feet deep (a 1-to-2 ratio or better), that proportion makes it look more like a border and less like just a narrow edging strip. Better still, create your border using irregular shapes and curving lines. Then, the space itself becomes interesting, and its small size diminishes in importance. Garden style can mean a preference for pastels over hot colors; a theme, such as fragrance; or an actual style, such as cottage or woodland gardens. You have more leeway here than in other areas, but because your space is limited, every plant counts. You may love red poppies, but they are going to stand apart from an otherwise pastel garden. When choosing plants for style, it helps to group them. This way you can see the sore thumbs. Ferns, pulmonaria, and Solomon's seal, for example, will look lovely together. Primrose may suit your site conditions, but the loud colors may be too jarring for the look of a woodland garden. Or not. Color preferences: Limit your plant choices to two to three colors, maybe even only two to three different types of plants. If you start by selecting only three different plants, you'll probably want at least three of each, so that's already nine plants. Play with positioning them in the space, and take it from there. You can always add more. Texture and form: Unlike color, variety in texture and form will give the garden depth. With only a handful of plants able to go into your small space, look for plants with long-lasting appeal, such as distinct foliage—perhaps variegated, colored, or lacy—and a long season of bloom. You may be able to get away with a sequence of blooms if you include spring bulbs. Quantity: How many plants you need or want of each type depends upon the size of the space and the width or spread of the plant. There are two schools of thought about how densely to plant a new garden. If you want your garden to look mature and full its first year, you will need to space young plants more closely or buy larger plants. You will get an immediate impact, but you will also need to begin dividing sooner. If you have the patience to allow your garden to fill in slowly, you can leave room for the plants to grow into their new home and fill in temporarily with annuals. There really is no "final" choice when it comes to plants—because gardens are never finished—so plan as realistically as you can. Sketching the area out on graph paper first can help you to visualize how your garden will look. This may be the best route, but many gardens would never get planted if we waited until we felt things were perfect. It can also be hard for a new gardener to equate what's on paper with reality. Sometimes you just have to get started. You'll learn as you go. The bottom line: Just check that most of your plant choices fit the criteria you've outlined and the growing conditions you have to offer. Don't squeeze in too many different plants, and your small space garden should look and grow just fine.